We wrapped last week up, as you may remember, with a monumental loan payment. Ironically, we celebrated by spending more money. Haha. I bought a dress I’ve been watching for a while, waiting for it to go on clearance, and we bought curtains. Curtains? This is a big deal, people. Maybe you don’t know this, but I loooove floral prints. However, the wonderful man I am blessed to be married to and get to spend the rest of my life with doesn’t appreciate them quite as much as I do. He’s fine if I wear them, or have my own things in floral print, but he really doesn’t like to decorate with floral prints. Those floral lampshades in our bedroom? That was a win for Deborah, and part of Josh’s soul dying. (Over-dramatic for comedic effect.) Back to curtains…. So, our new house has a study! Josh and I both have desks in there, our bookshelves, I have plenty of craft storage, and we both have our own little corners to decorate. But… I felt I needed to involve him in the curtain decision since it is both of our spaces. You can see the curtains of compromise (as well as the dress I am anxiously tracking) below! 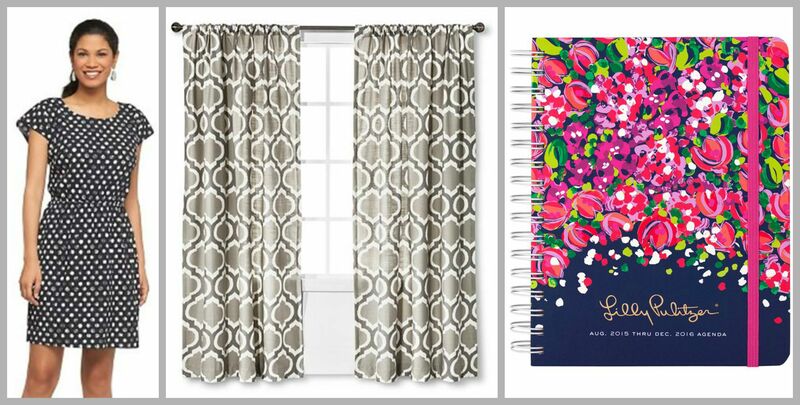 Dress- Curtains of Compromise- Lilly Planner! Last week, I tried a new recipe: mango salsa! It was my first attempt, sparked by Josh seeing mango and jalapeno salsa at Moe’s and made a comment that it sounded interesting, but can’t handle the “Hot” level salsa. How did it turn out? Honestly, I wasn’t as excited about it as I hoped it would be. Maybe I need to try it today, since the flavors have had a chance to blend… but if you are interested in trying it here’s the link. Even though it wasn’t an instant favorite, it was fun to try a new recipe, especially after the month of take out! Josh is starting classes TOMORROW. Ahh. Yesterday, we sat down and planned out a new schedule, at least as well as we can. Weekends are filling up, homework time is being scheduled, and I’m trying to get back in the mindset that Josh isn’t as flexible as he has been all summer. He has due dates, more meetings, and our nights of Netflix will have to be spread out a little more. Along these lines, I have ordered a planner. You may remember me mentioning my Lilly Pulitzer preoccupation. Well, I have stepped into the world of Lilly today! I ordered my first Lilly planner (see above picture) after reading raving reviews, and thinking about how nice it would be to have a physical planner I can write in again. I am such a list-maker, I think it would be good for me to have a central planning center again. -Read for fun. I checked out the second Hunger Games book! We’ve made it! YOUR LAST YEAR OF SEMINARY HAS BEGUN. It is always a stressful transition for us at the beginning of a semester, but I feel like we have learned so much doing this together. I pray that despite the stress, deadlines, un-met expectations, late nights, and blocked-off weekends, you enjoy it. I pray that you soak up all you can, filling your toolbox with things you can use in the future. I pray that we’re able to learn and grow together, and that the Lord uses our investment in each other and in seminary to glorify Him.